This kit includes a fuser, 1 transfer roller, 4 feed/separation rollers, pickup roller & separation pad for the multi-purpose tray, and 3 pickup rollers for trays 2, 3, and 4. You can save some money by purchasing the fuser on exchange; see exchange terms in the details below. Maintenance kit with fuser exchange. PrinterTechs compatible fuser, HP 4300 series. Maintenance kit without fuser exchange. 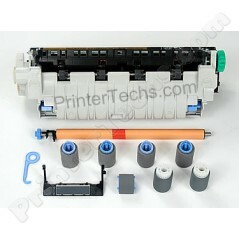 PrinterTechs compatible fuser, HP 4300 series. Maintenance kit with fuser exchange. New HP fuser, HP 4300 series. Maintenance kit without fuser exchange. New HP fuser, HP 4300 series. Bonus Parts! The following parts are now included in our kits, but they won't be found in many of our competitors' kits, including Hewlett Packard's. 1 Tray 1 (multi-purpose tray) separation pad -- unique to PrinterTechs maintenance kits! 2 NEW! Paper pickup rollers -- a PrinterTechs exclusive!